My first portrait - Finished I think! Thread: My first portrait - Finished I think! 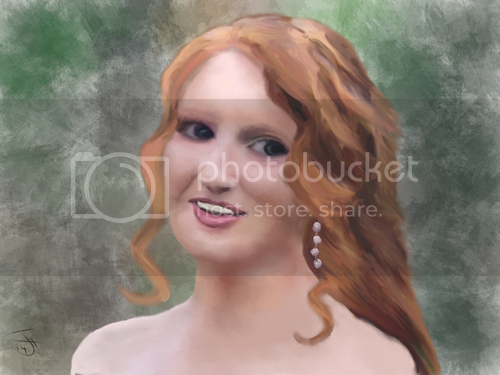 Painted with oilbrush - my first try at portrait painting - subject is my 17yr old granddaughter. I outlined a photo and picked the colours from the reference photo. As usual the background presented a problem. I ended up using a decorative paper from the ArtRage collection. I'm toying with the idea of printing on canvas so I would appreciate any advice on improving the painting, especially a suitable background. I'm including the orig photo so you can see what I was trying to capture. The original was small so I enlarged it - hence the poor quality. Last edited by Enug; 04-19-2014 at 10:02 PM. Thank you - I'll try that. A lovely girl. I think even though the edge of her cheek and forehead are blurry in the photograph I would sharpen up the lines in the painting. Well done! I so admire people that do portraiture. Thank you both for your comments - I think I need to work on the eyes also. I've worked on the image a bit more. I think this is a great painting & you've certainly captured your Granddaughter! Thanks so much. The eyes are bothering me. I will practice more on these. Thanks to everyone who made suggestions. You made a perfect reproduction of her features in this portrait. I would just suggest to work more on the background so as not to make the portrait look a little like a sticker on top of it. All times are GMT +13. The time now is 06:20 PM.